Jenee Desmond-Harris wrote a piece for Time titled "Why Michelle's Hair Matters." It's both refreshing and sad that black hair keeps making the news. 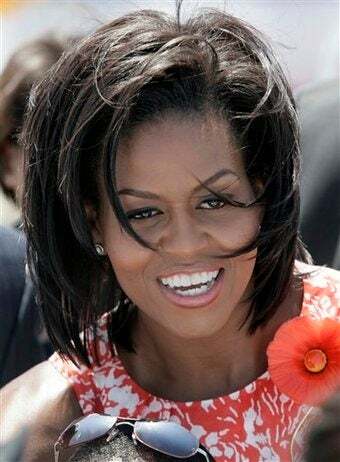 One might think having a black First Lady who is widely praised as sophisticated and stylish would represent a happy ending to the story of black female beauty and acceptance. Alas, our hair still simultaneously bonds and divides us. "There is no hair choice you can make that is simple," says Melissa Harris Lacewell, an associate professor of politics and African-American studies at Princeton. "Any choice carries tremendous personal and political valence." Even though I'm biracial and should theoretically have half a share of hair angst, I've sacrificed endless Saturdays to the salon. It is unfathomable that I might ever leave my apartment with my hair in its truly natural state, unmoderated by heat or products. I once broke down at the airport when my gel was confiscated for exceeding the 3-oz. limit. I'm neither high maintenance nor superficial: I'm a black woman. On the other hand: Much like attention to Michelle Obama's clothes, arms and bottom, attention to her hair feels, well, disrespectful. And plain old sad. It's not like black women are newly arrived creatures from outer space — so why is the way we deal with our hair "news"? It's been over 100 years since Madame C.J. Walker and Garrett A. Morgan. Michelle's hair matters, but surely not as much as a whole lotta other stuff she's working on. Are You Tired Of Talking About What Michelle Obama Is Wearing? Michelle Obama Spurs A "New Arms Race"